and why its been so difficult to pin down the exact number. 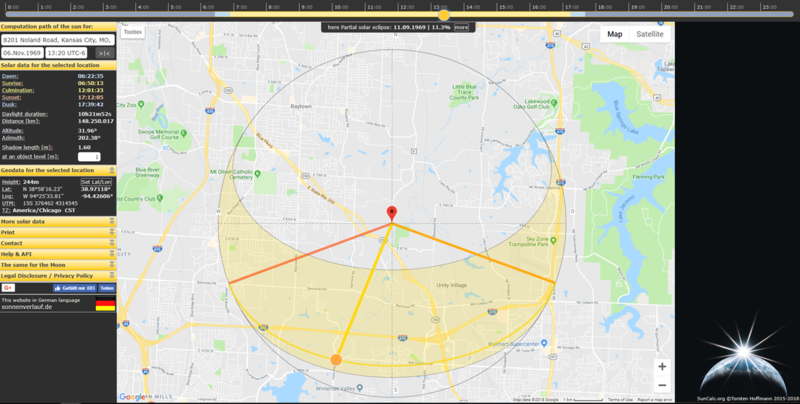 Written by Landon Eskew, proud owner of Twister Torino 0A38J133457 and site admin for the new Twister Special Registry. With the recent discovery of Dustin Harriman's Ranchero Twister Special, hope has been restored that another jackpot lies in the dusty confines of someone's barn. For the last forty-some years we incorrectly believed that four of these cars were created but when no one came forth with proof many believed that none ever existed at all. As a community we now agree that there were only two produced. In an attempt to fact check this I have found something that I want to share with you all. "In the picture of them all sitting at KCR [the Rancheros] are at the end of the line up so very difficult to see them but I recall studying that pic with a magnifying glass for many hours and there were only a few pics of that Twister Special gathering." It occurred to me that if there were either two, or four, or no Rancheros, I'd be able to use my digital "magnifying glass" and count them right? An instant afterwards, with my mind racing, was that only recently has a second picture from the other side been unearthed from back in the day. Did Steve attempt to count the cars in this picture too? By my guess, it appears that there are four cars on the end - AND THEN A GAP. ​I make out four fenders and then the outline of a driver side window that doesn't match the pattern of windshields. There is a faint line of sunlight on the ground between them and by a stretch of imagination the dog dish hubcap may be visible, although it could also be the glint on the bumper of the Mustang. Why were four cars separated in this photo? Mr. Temme will be responsible for the final positioning of the 190 "Twister Special" units. These units must be lined up numerically for easy location by dealers. Mr. Davenport will supply Mr. Temme with a list of all units, each with a number assigned. On Thursday, November 6th, at 1:00 P.M. - All District Travelling Personnel, not on other assignments, will report to Mr. Temme at the Kansas City Raceway. Mr. Temme will provide specific instructions on the final preparation and positioning of the "Twister Special" units. Mr. Temme will make arrangements to have all units locked and the keys secured before the conclusion of the work session. I am also told that there were 4 or 5 Twister Special Ranchero GT's produced. I am currently working on getting a serial number pull for all 1970 Rancero's (sic) shipped to the Kansas City Sales District. Will furnish more information on these if it becomes available. Zero Ranchero cars - now proven false with the finding of 0A48J141701. Two Ranchero cars - Current best guess by the teamwork of both Wes Eisenschenk and Kevin Marti. Without knowing their exact methods of searching the Ford database, and until proven otherwise, both professionals are highly confident that there were only two Twister Special Ranchero cars built. Four Ranchero cars - the longest running rumor of all, probably perpetuated by someone at one point in time making a similar comparison as to what I've done above. Given a pre-Internet age and no further CSI-level detective work, this seems like a plausible method as to how someone decided on the number of four. Five Ranchero cars - Terry Fritts mentions above in his May of 1985 letter to members of the Twister Special Registry that there could be "four or five." While the empty slot in the above picture could be reserved for the oddball Torino 0A38J134632 it could easily have been reserved for a Ranchero that had not made it to the line-up yet. The rest of this write-up is at the best assumptions of the author, yet purely hypothetical, so take it with a grain of salt. Not thinking about this photo from todays' standards, nor accounting for whatever early-2000's technology was used to scan the photo, and not factoring in the JPEG compression that it has seen multiple times... Realistically these two photos were to be used as high-quality promotional material taken at the same time, most likely by a professional photographer working for the Ford Public Relations Department. If we had the original photos from 1969 in-hand they would be much clearer. 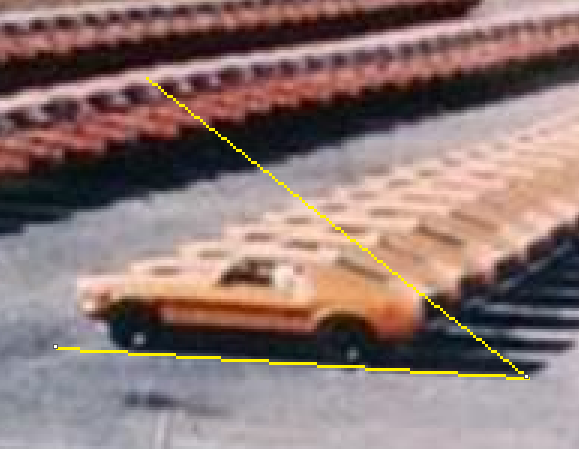 For my rough calculations, if the trunk of the Mustang is one unit tall, the shadow cast is about 1.6 units long. This is the dumbest picture of a Twister Special that has ever been taken and please quote me on that. I was attempting to be entirely too precise with my facts when I finally decided since I'm making this all up anyway I'll just go with a rough guess instead. ​1.) 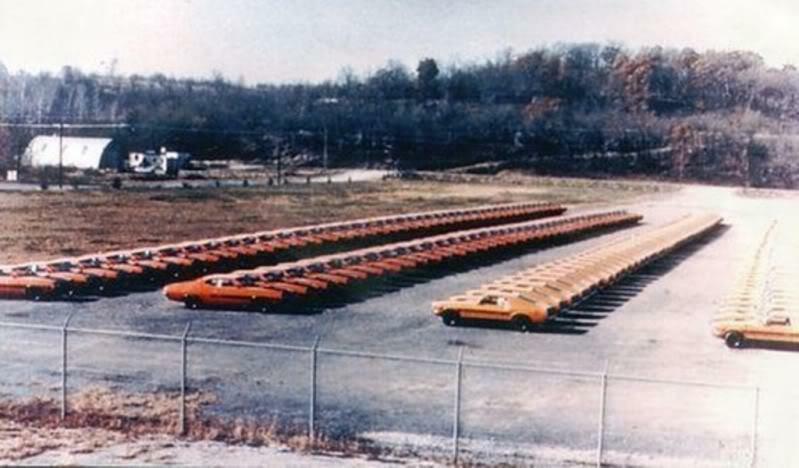 11/6/1969 1:20 P.M. - These cars were to be delivered during the morning of Thursday, November 6th, 1969 and it would have taken a significant amount of time to get them all placed by their "no later than 3:00 P.M." deadline. They would have needed dozens of laborers to park cars and get everyone off the field out of the range of the camera in less than twenty minutes. This is a highly unrealistic timeline. Knowing what the collective minds of over 100 muscle car enthusiasts would look like, I doubt they would be able to make EVERYONE leave by this time. This was supposed to be a fun and enjoyable event, not another day at the office. I ended up zooming in closely and spent a considerable amount of time putting a blue dot on every Vermilion windshield in the picture... I don't think the Public Relations Department at Ford ever assumed anyone would physically count the cars in the photo but they're significantly short on the total number produced. Everyone has always assumed they are all there. 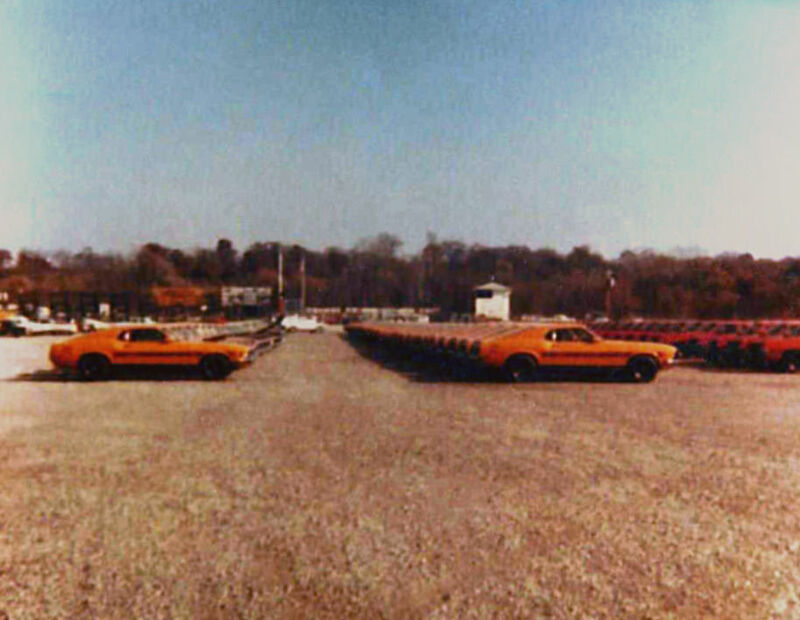 There were 90 Torino Twister Special cars made and in this photo there are nine cars missing. If it were possible to count the Mustangs I would have done so as well, but the photo quality isn't there to do so. No Vermilion-colored Rancheros are visible in any photos to date. ​2.) 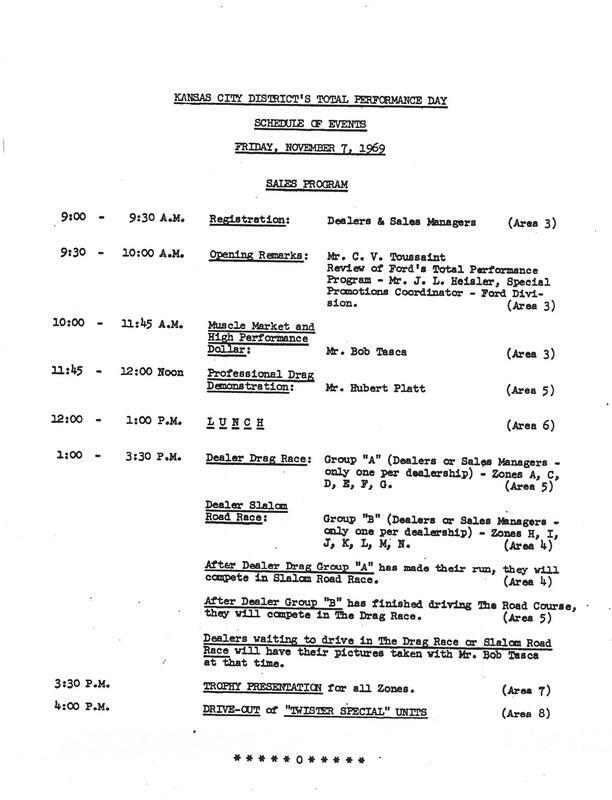 11/7/1969 10:40 A.M. - The cars would have been parked and finalized by this time the next day, but the "business half" of the program was taking place. Because we don't expect to ever find pictures of people standing around listening to a presentation it is fair to say the professional photographer was not onsite taking pictures yet. ​3.) 11/7/1969 1:20 P.M. - At this point the festivities are in full swing - lunch is over and people have made it to their respective locations for drag and slalom racing. This is when the Ford Public Relations photographer would have been present and when both angles of the cars were taken. What better time to photograph an empty field than when everyone is focused on racing their friends down a stretch of black top with the pinnacle of Ford technology? As for the missing vehicles, half of the zones would need a slalom car and the other half needing a straight-line drag machine, removing seven from the lineup and having an eighth additional floater Torino at the ready should one decide to "over-perform" on race day. With 500 dealers and representatives at the event, it's not a stretch to say that approximately 40 people in the 13 rotating groups would each need their own pair of cars to drive. 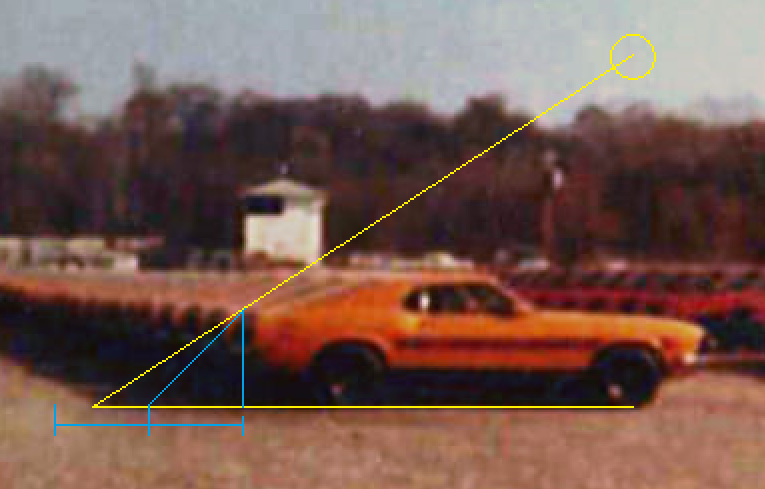 Wes Eisenschenk provides us with a photo of the location of the ninth missing Torino - sitting off to the side paired with a Twister Special Mustang for the dealers to be photographed alongside Bob Tasca. Without verifying the Mustangs or Rancheros, this rounds out a hypothetical situation on the nine missing cars from the photo. Again, all of this has been an assumed situation, not necessarily 100% factual. 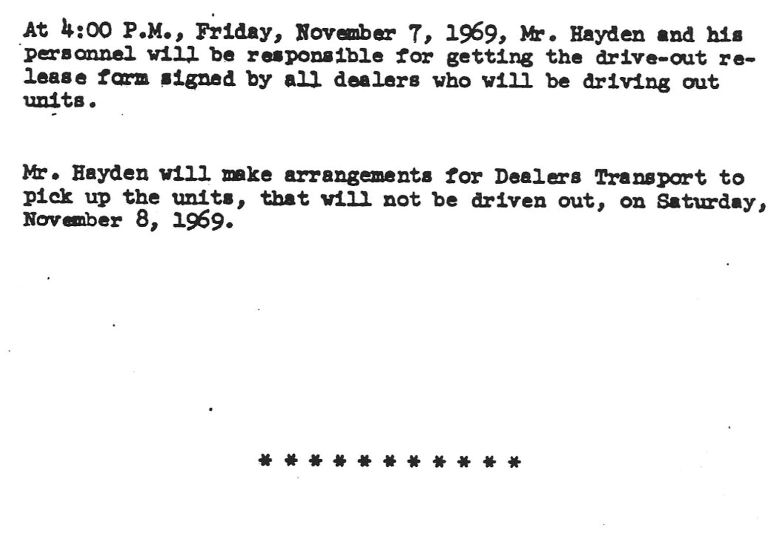 At 4:00 P.M., Friday, November 7, 1969, Mr. Hayden and his personnel will be responsible for getting the drive-out release form signed by all the dealers who will be driving out units. Mr Hayden will make arrangements for Dealers Transport to pick up the units, that will not be driven out, on Saturday, November 8, 1969. The photos could have been taken the day after the event and this would be another explanation as to why no one is casually strolling the field. However, this makes no sense because it was the job of both Mr. Hayden in coordination with Mr. Sadler to get these cars off the field and to their respective locations and there would have been transport trucks and representatives swarming the field to hand out keys and packets of information to spread these cars far and wide to their respective dealerships. This is why the information leaves more questions than answers. We now know that by the Marti Report, 0A48J141701 was built two days before the Total Performance Day event took place. Dustin Harriman and I have gone back and forth on the phone as to how the single-known Twister Special Ranchero made it from Atlanta to Kansas City in less than 48 hours' time when it could very well be the one thing that no one has considered in a half of a century - whether an engine, an axle, or a carburetor, it was never at the event to begin with. This also explains why there is little to no information on the Twister Special Ranchero - if 500 people participated in and then left the event to tell people that the Ranchero wasn't there - then it never existed in the minds of those people and the ones they shared the information with. 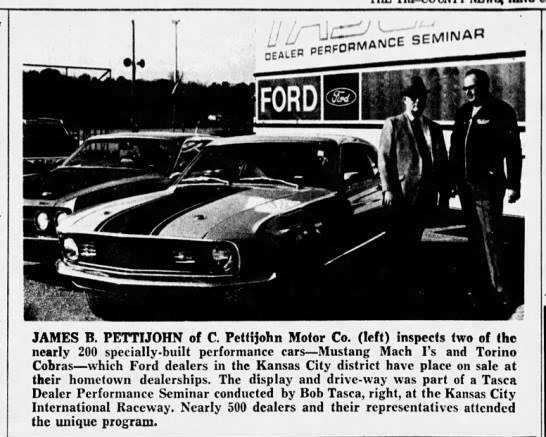 Sure, a couple Rancheros end up spread far and wide at dealerships across KC District Sales Office #53 - but the pending fact remains that these cars were written off before the Total Performance Day even happened. 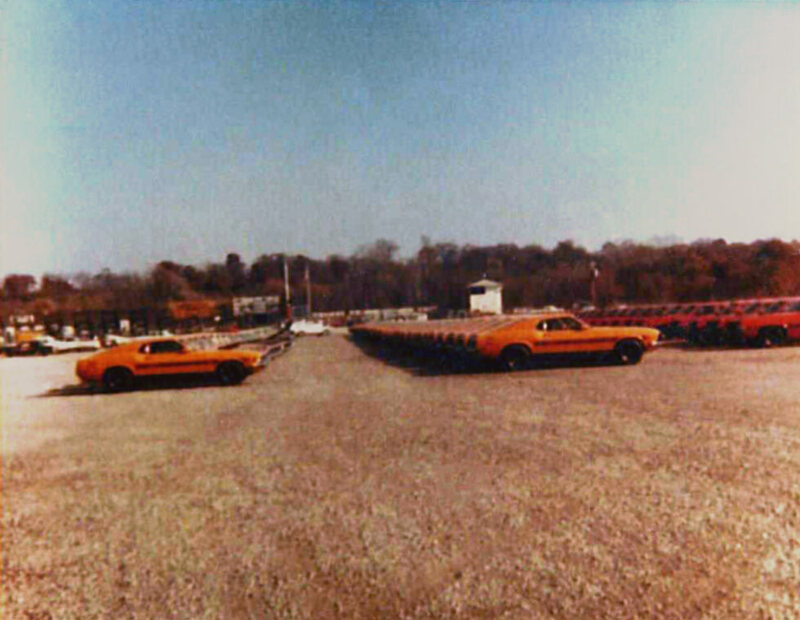 While the two Rancheros may have been the dealerships' ultimate winner-take-all first-place prizes for the winners of the drag and slalom events, Tasca and the others knew they wouldn't show up in time and consequently were never mentioned during the presentations the morning before or in publications thereafter. The rarest muscle the Midwest was ever to claim was snuffed on a production technicality. This is a true ghost of a car. In the coming weeks more information about the Ranchero car will be revealed along with pictures from its official unveiling at MCACN in Chicago on November 17-18, 2018. Specific information on the car can be found here. ​In the coming months the other known Ranchero VIN will be released to the public. Early hint - it was produced THREE DAYS before the Total Performance Day event, leading us at the new www.twisterspecialregistry.com to believe it wasn't present at the event either. In the coming years we hope to connect prior and current Twister Special owners and fans with an ever-growing community of followers. Please continue to monitor the site regularly for future changes and announcements. In the Total Performance Day bulletin, L.K. Hayden was directed to "make arrangements with Mr. Bob Sadler" for placement of the vehicles. This is the only time Mr. Sadler is mentioned in the Documentation. An obituary for a Bob Sadler (December 26, 1931 - November 23, 2007) of Joplin, Missouri is available online. This individual would have been 37 years old at the time and having lived in Joplin all his life as per his obituary would have put him within a 2.5 hour drive from the event. He was still an active bowler in 2001 and there may be friends and family nearby that can share stories of his time working for Ford. Other potential contact information is available online as well. The Kansas City Assembly Plant on Highway No. 69 in Claycomo, Missouri that opened in 1951 is still in operation today. 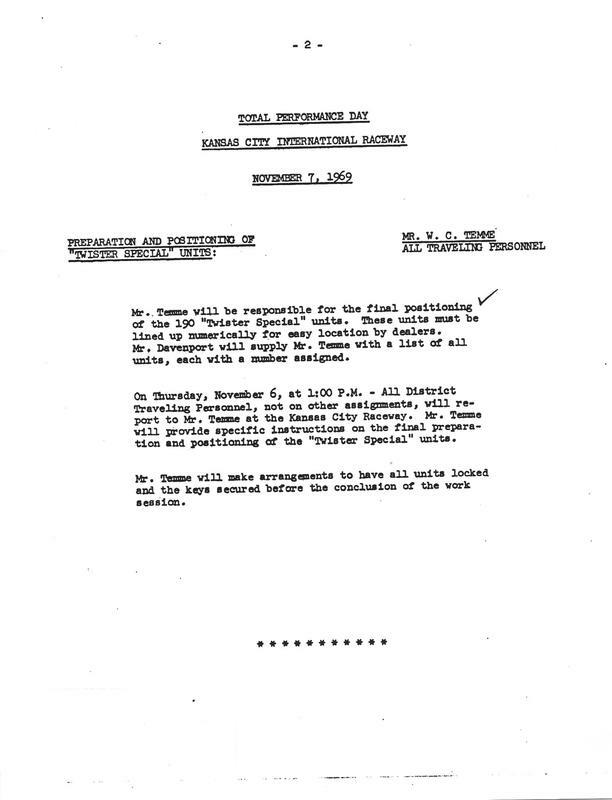 While the documentation from 1970 doesn't specifically have a numbered address, it can be assumed that this is where the bulletin originated from. 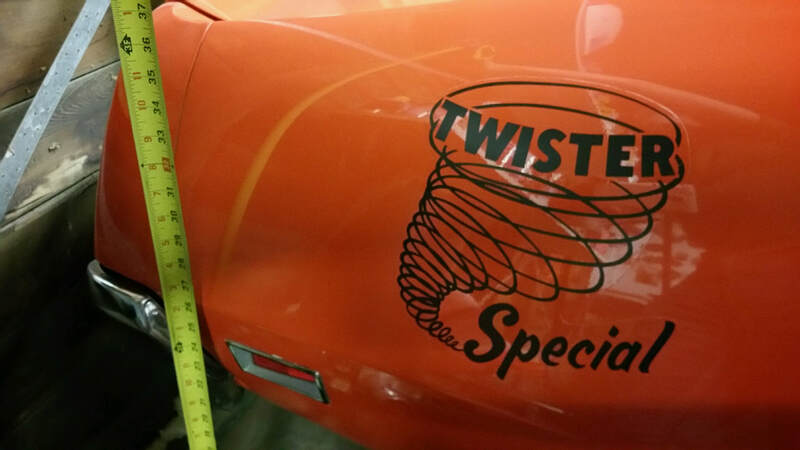 They may still hold the key to further documentation in their archives from the event that may help with more details about ALL Twister Special cars, not just the Rancheros.